Decreasing session planning time. All interventions come with instructions and worksheets. Allowing you to take a break from constantly having to come up with your own session plans. Giving you a fresh starting place to implement and generate new ideas. Expanding your abilities and skills as a music therapist. Providing music therapy resources, ideas, and interventions for your clientele. Music therapy worksheets may serve as assessment tools, self-reflection tools, session openers, or topics for discussion. These worksheets provide an opportunity for reflecting on music and creativity, and can be useful as a break from playing music, homework assignments, and for facilitating music based discussions and reflections. 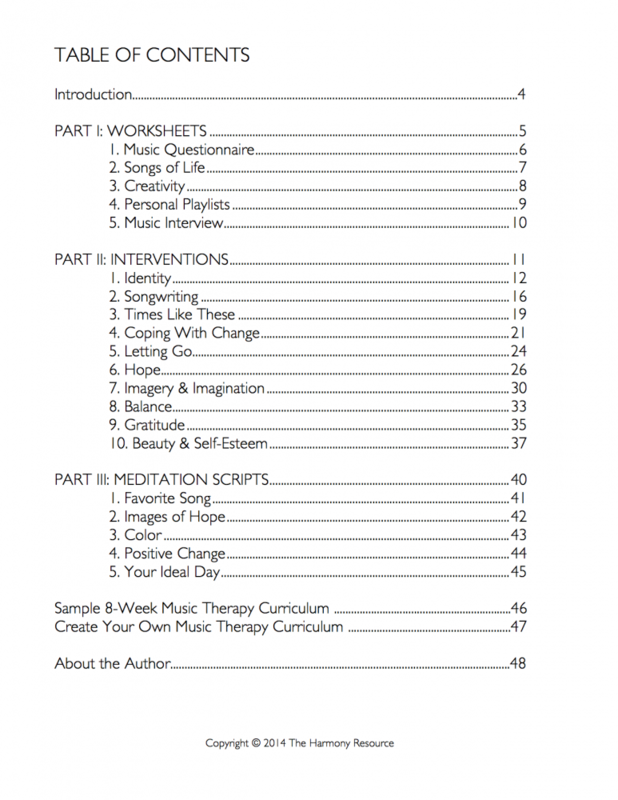 10 Music therapy interventions are presented in universal themes, each with instructions, suggested music, and accompanying worksheets to facilitate a structured and goal-oriented session. 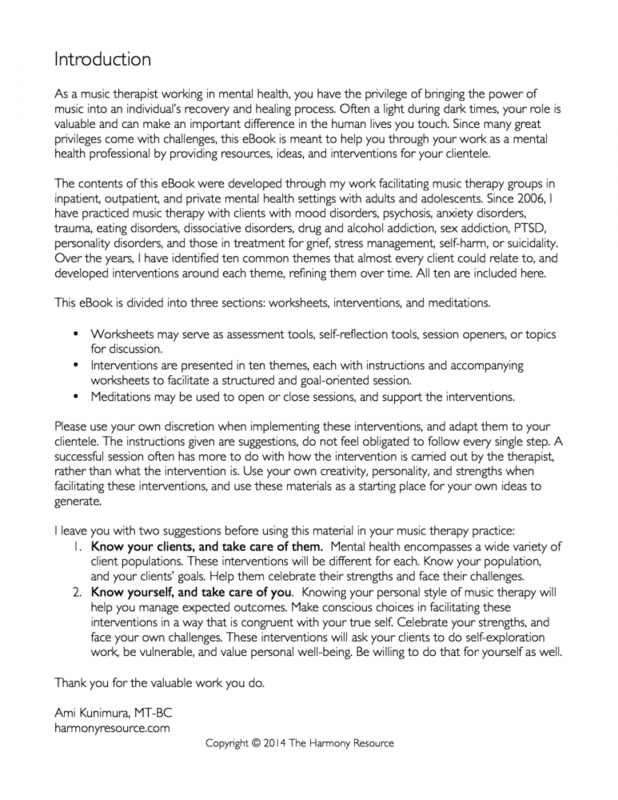 The interventions used within these themes are meant to stimulate a deeper level of emotional connection with the theme and music, to later be processed within the group and/or with the therapist. These interventions were designed for groups but may be also used with individuals and adapted to suit various functioning levels and time frames. 5 Guided meditation scripts that are short and simple. They may be used to open or close sessions, and support the interventions. Working with adolescents and adults in acute mental health is very rewarding. 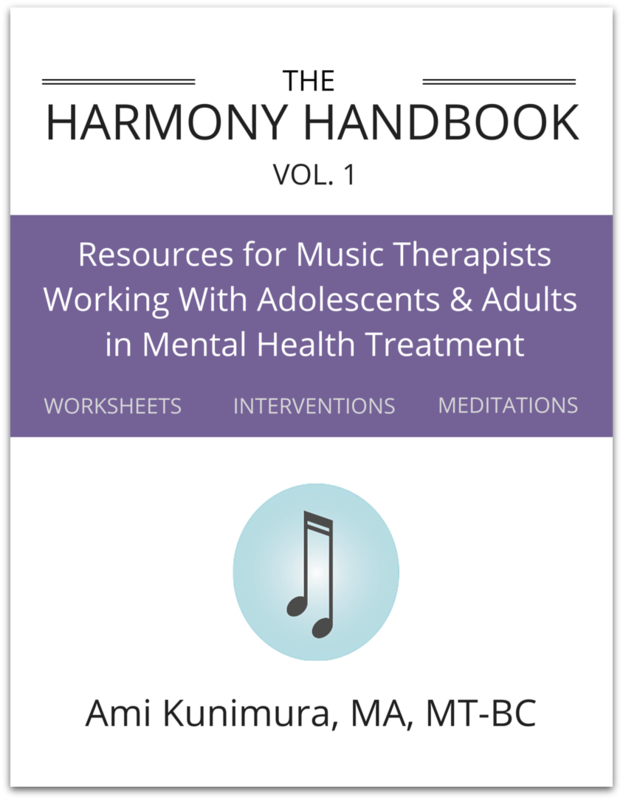 The Harmony Handbook is a helpful sourcebook full of creative, insightful, and realistic interventions to improve and supplement current music therapy practice for this population. Ami leaves room for the music therapist to determine the best uses for each section of interventions, which allows the reader the chance to not just follow a recipe, but integrate the ideas into their own practice. The structure of this book permits easy understanding of how each intervention can unfold with mindful attention to important themes that can be addressed with this population. Ami also offers further suggestions to help develop the theme or intervention further. The Harmony Handbook is a valuable sourcebook, full of ideas that aim to inspire clients to connect with music and their treatment objectives. My testimony to this work of art is one filled with deep gratitude and appreciation. Ami obviously has not only worked well with these individuals, but has done so in a way that authentically embodies the artistic expression of what we do as music therapists. Members of my substance abuse rehab groups have resonated with these ideas telling me things like, “I not only like these songs, but what you do with them; it applies directly to what I’m going through.” Her brilliant tapestry of weaving together specific interventions that can be molded to fit the varying needs of clients in mental health treatment has also helped in shaping my own work in this field.